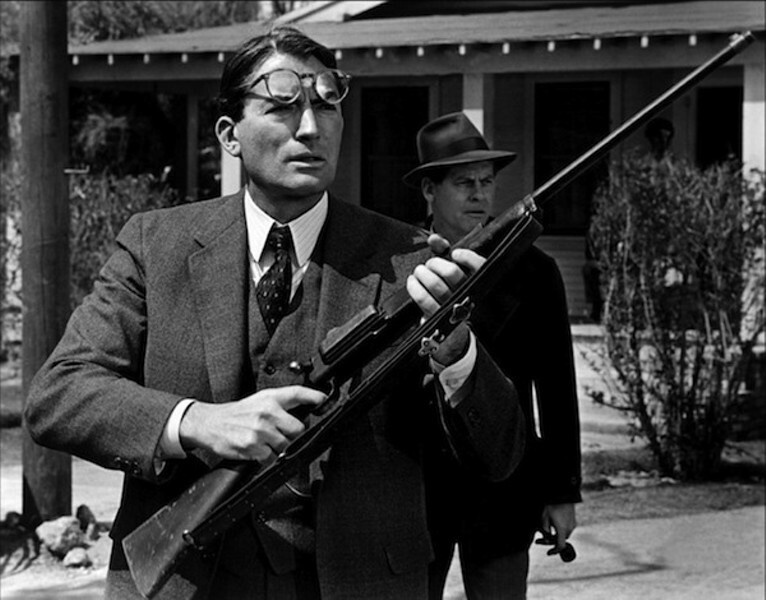 TO KILL A RABID DOG: Atticus Finch (Gregory Peck, foreground) and Sheriff Heck Tate (Frank Overton) deal with a dangerous animal in To Kill a Mockingbird. 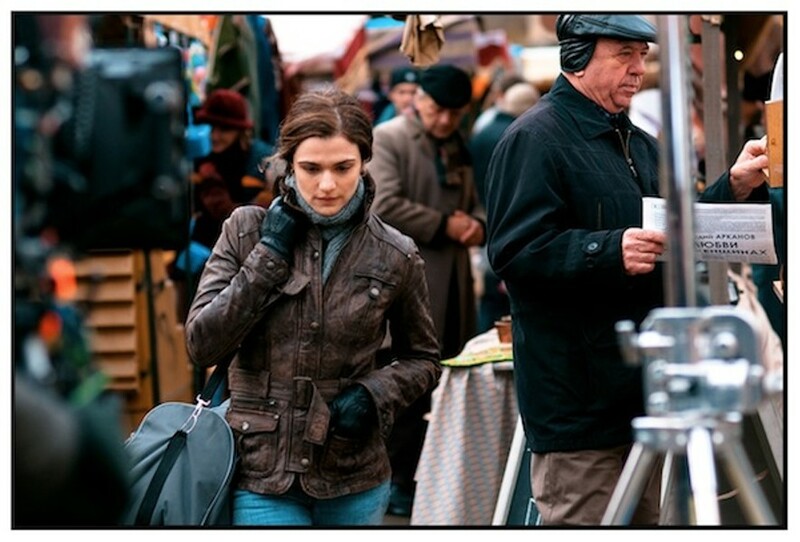 50/50 (2011). This comedy-drama centers around a cancerous presence, and that refers to Seth Rogen as much as it does to the malignant tumor found located on the spine of young Adam (Joseph Gordon-Levitt). Carve Rogen out of the picture, and its chances of being a truly moving picture about people coping in sickness and in health increase exponentially. This is nothing personal about Rogen, who I generally enjoy watching — heck, I didn't even mind him bringing his slobbery man-boy act to the iconic role of the Green Hornet. But 50/50, inspired by scripter Will Reiser's own battle with cancer, doesn't need his services, which only get in the way of a potentially heart-rending story about how a 20-something who theoretically has his whole life ahead of him must cope with a tragedy that threatens to cheat him out of his future. 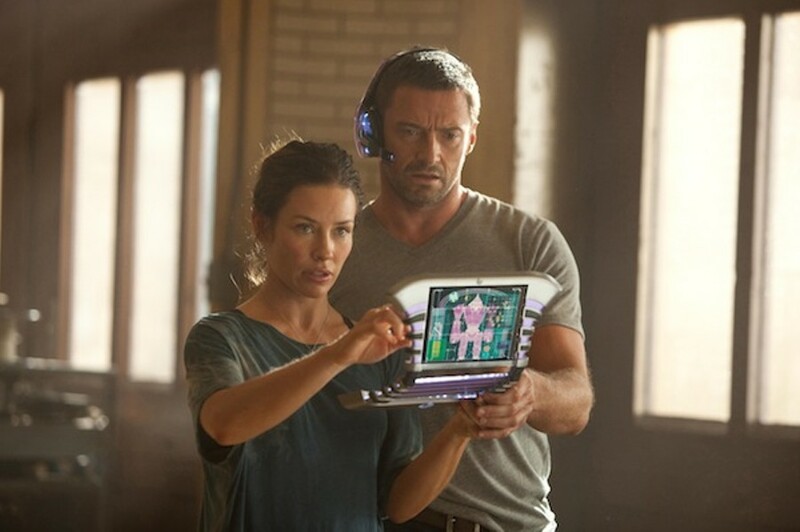 Gordon-Levitt delivers a sensitive portrayal as Adam, perpetually trying to get a grasp on emotions that understandably don't know where to go. Adam shares an interesting relationship with his therapist (Anna Kendrick), a medical newbie who isn't quite certain how to comfort her patient. He has trouble with his girlfriend (Bryce Dallas Howard), who's mentally ill-equipped to deal with a partner who's now bald and barfing all over the place. He bonds with two older cancer patients (Matt Frewer and national treasure Philip Baker Hall) who take him under their wing. And he has difficulties communicating with his mother (Anjelica Huston), a drama queen who's already dealing with an Alzheimer's-afflicted husband (Serge Houde). These are all intriguing relationships, but every time we become immersed in these particular character dynamics, along comes Rogen as Adam's unlikely best friend Kyle. Kyle clearly has Adam's back, and had Rogen, in his capacity as one of the film's producers, graciously allowed another actor to play the role or, since the part is based on himself, at least played it more realistically, we might have had something special. But the film's delicate mood is broken anytime Kyle opens his mouth to talk about shaving his balls or getting laid or basically anything that trumpets his obnoxiousness. 50/50 is a good movie about 60% of the time, but a higher percentage would have been appreciated. DVD extras include audio commentary by Rogen, Reiser and director Jonathan Levine; deleted scenes; and a making-of featurette. FRIDA (2002). Even after all these years, we should still be thankful that it was the Salma Hayek version, not the proposed Jennifer Lopez one, that made it to the screen — after all, who wants to see a Frida Kahlo biopic that would doubtless find the Mexican artist putting aside the paintbrushes (and putting a part in her unibrow) for a career as a glamorous songbird? But seriously, as far as screen biographies of artistic sorts go (always a gamble, since it's hard for film to accurately convey the creative process at work), this one ended up in the right hands, as director Julie Taymor (Broadway's The Lion King, the underrated Across the Universe) uses various colorful conventions — an animated sequence designed by the Brothers Quay, the melding of actual people and artwork, the stunt casting of Edward Norton, Antonio Banderas and Ashley Judd in small roles — to effectively touch upon the key incidents in Kahlo's life, from the trolley accident that kept her perpetually in pain over the years to her brief fling with Leon Trotsky (Geoffrey Rush). 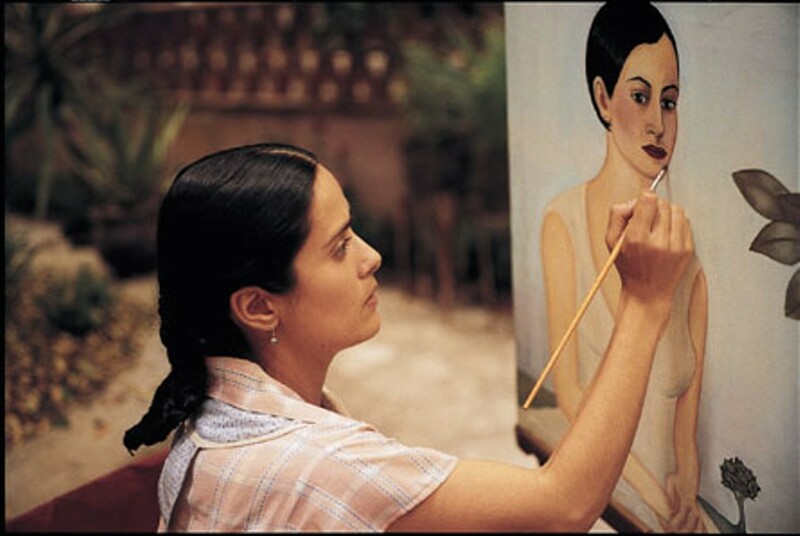 Still, the film's centerpiece is her long, complex relationship with husband and fellow artist Diego Rivera, and it's the robust performances by Hayek and Alfred Molina that ultimately give Frida its soul. Nominated for six Academy Awards (including a Best Actress bid for Hayek), this won two: Best Original Score and Best Makeup. Blu-ray extras include audio commentary by Taymor; a conversation with Hayek; Bill Moyers' interview with Taymor; Hayek's recording sessions; the featurette The Vision, Design and Music of Frida; real locations from Frida's life and art; and an interview with singer Chevela Vargas, a close friend of Frida and Diego (she allegedly was also one of Frida's lovers) who's still making music at the age of 92. GOOD MORNING, VIETNAM (1987) / DEAD POETS SOCIETY (1989). A staid, conformist institution gets shaken up by the arrival of a wisecracking maverick whose unorthodox behavior eventually gets him booted, but not before he makes a difference to many people. That's the general plotline of not one but both movies that helped jump-start Robin Williams' idling film career. Despite becoming a household name thanks to his work on TV's Mork & Mindy, Williams didn't immediately make a successful leap to the big screen, finding himself stranded in a number of critical and/or commercial underachievers (e.g. Popeye, The Survivors, Club Paradise) for the better part of a decade. 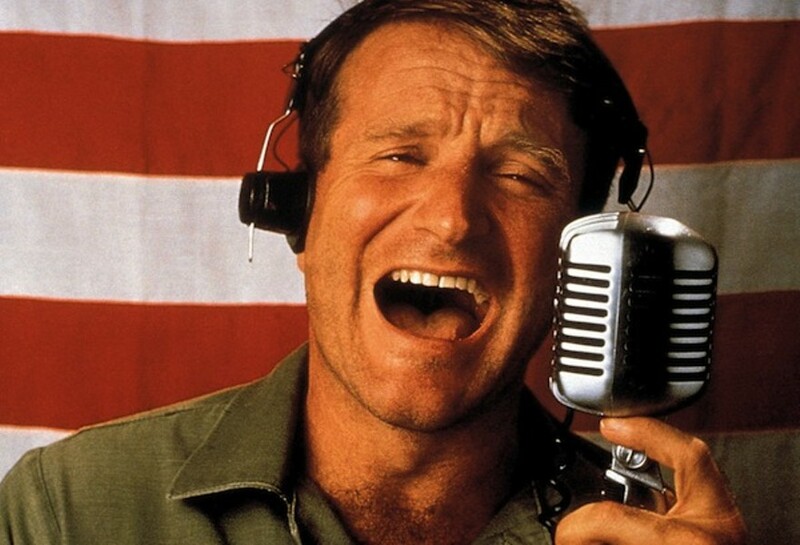 It wasn't until Good Morning, Vietnam that he landed the right role, resulting in his first box office hit and his first Academy Award nomination (probably at the expense, alas, of the more deserving Steve Martin in Roxanne). Loosely based on a true story, the film casts the comedian as Adrian Cronauer, a military DJ whose manic on-air shenanigans are a hit with the troops but infuriate some of his superiors. Over the course of many years, Williams has soured into one of our most tiresome and least amusing comics, but here he's fresh, vibrant and very, very funny.